You are here: Home / Blog / Does Your Child Need Glasses? 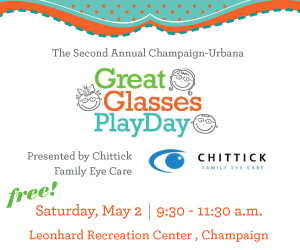 Editor’s note: We are very grateful to Chittick Family Eye Care for being the sponsor of the second annual Champaign-Urbana area Great Glasses Play Day on Saturday, March 2 at the Leonhard Recreation Center in Champaign. This free event celebrates young children who wear glasses, patches, and contacts. Please join us! Last year at this time, we faced the diagnosis that our toddler daughter needed glasses. Now, that seems completely normal. I can’t imagine my daughter without her glasses, they are such an integral part of her identity. But at the time, we were full of uncertainty and fear. I was relieved to find an online community (littlefoureyes.com) to answer my questions and a local resource to help us get through the process – Chittick Family Eye Care in Savoy. Q: When do I need to take my child to see the eye doctor? A: Even with no vision problems we recommend the first eye assessment occurs at 6 months -1 year of age. The eye doctor can check for abnormal amounts of refractive error, eye muscle abnormalities, and eye health problems at this visit. The State of Illinois requires an eye exam within one year of the first day of entering kindergarten and no later than October 15. Q: What are some signs that there is a problem with my child’s vision? A: Common signs include complaints of blurred vision, covering an eye, squinting, rubbing eyes, holding things close, complaints of headaches, development of a head tilt, complaints of words moving on page, a noticeable eye turn, and consistently sitting close to TV. Q: How can you tell my baby’s prescription when s/he can’t talk? A: We use an instrument called a retinoscope, loose lenses, and fun targets to determine a baby’s prescription. Sometimes special eye drops need to be used to aid in this determination. Q: Where do you get a toddler glasses? 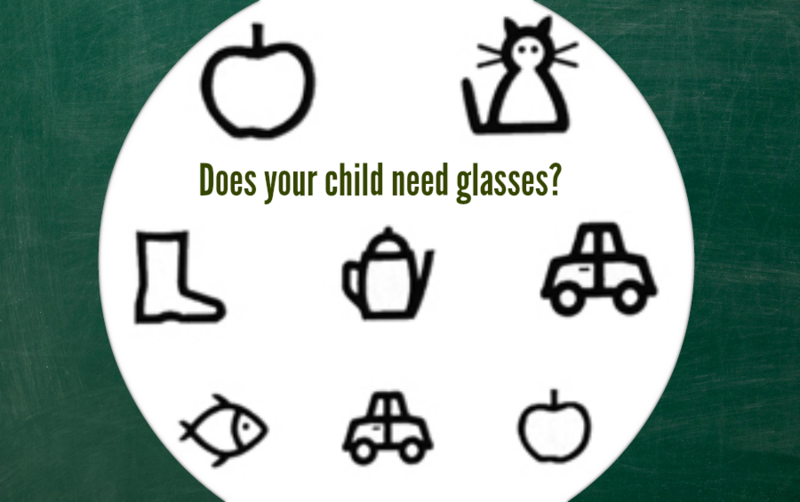 A: Chittick Family Eye Care has an excellent selection of MiraFlex glasses for your toddler. http://www.miraflexglasses.net/ (They also have styles for older children as well). Q: I am overwhelmed with feelings of sadness as my child gets glasses. Is this normal? A: Absolutely, we all want to take all of our children’s problems away. Just remember that most vision problems are treatable and there are many types of fun and stylish eyewear for kids. Want to meet other parents and young children with glasses? Come out to our second annual Champaign-Urbana area Great Glasses Play Day on Saturday, March 2 at the Leonhard Recreation Center in Champaign. This day celebrates young children who wear glasses, patches, and contacts, and is a national event. FREE!